Obviously there are two pieces to that – there are people that are renewing who came in at full price, and then there are people who came in at a promotional price that goes up at your first anniversary. And with both of those we’re seeing renewal rates well within the model that we set. 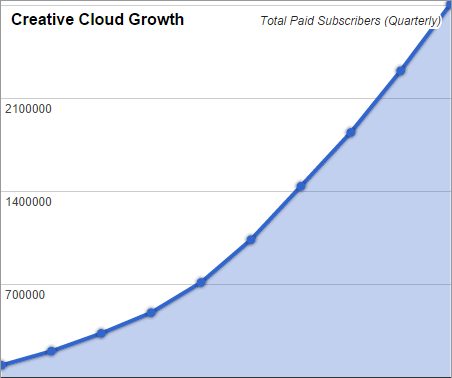 So there is traction for this new way of selling software… Looking at other already-published numbers, Creative Cloud paid membership continues to accelerate and has now passed 15 million subscribers (adding 65,000 new customers each week). And while Adobe still offers CS6 for those who prefer the previous licensing model and don’t mind using an older (2012) version, the Creative Cloud compares favorably on almost all measures and so far is one of the company’s best-reviewed products ever – likely because it gives full access to almost every top creative tool they make for one affordable price, without upfront costs. For subscribers who don’t want to choose between either everything or just a single-app, Adobe is now also offering the special Photoshop Photography Plan – consisting of both Photoshop CC and Lightroom 5 plus other tools and services for $10/month – which arguably should boost adoption further worldwide. Do you have any questions about Creative Cloud? Check out our extensive Creative Cloud FAQ, or just ask them below and we’ll get you answers fast! Not surprising that once you step on to the ‘rental’ bandwagon you have to keep on paying each year … or lose your software entirely. Perhaps the real story here is that 20% are choosing to stop? The first year that Creative Cloud was out (May 2012 – June 2013), people could choose to buy/use CS6 either via perpetual license or via subscription to the Creative Cloud. Even before the next version (CC) was announced, customers in early 2013 were already going with the Cloud version of CS6 over the traditional model by a 4-to-1 margin. The primary reasons for this: (1) it costs a lot less than paying thousands of dollars upfront, (2) it gives instant access to use everything, and (3) it’s always the latest releases with ongoing upgrades included. Then Adobe “CC” was released in June 2013 via membership only, and still CS6 continues to be offered by the company up to this day. Anybody who doesn’t want to stay with the Creative Cloud model has the freedom to choose CS6 instead… Yet the statistics revealed above clearly demonstrate that over 80% of customers are keeping it. Finally, of course, there’s the point that Creative Cloud is well-suited for short-term or situational needs such as classes at school, temporary employment or contract projects, etc… In such cases, those customers never had to pay steep upfront costs to use the products, and naturally would not continue their terms once the software is no longer needed. But those folks make the non-renewing numbers larger than they otherwise would be.